The final piece of funding for the Berkeley Community Garden plantings - completed a couple of months ago - just arrived. On Monday, our garden received a check for $10,000 from the community benefit program associated with the final piece of residential development at the Prudential Center. 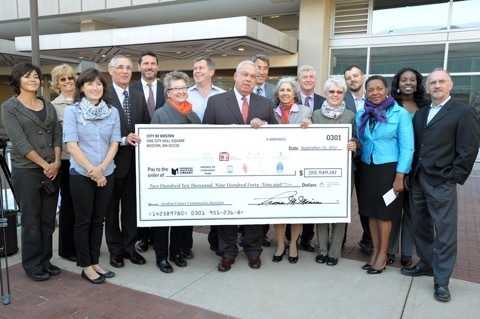 Here is a photo of me (representing BNAN/Berkeley), plus a representatives of many other community organizations (including Project Place, the Women's Lunch Place, the Emerald Necklace Conservancy and Ellis Memorial) along with the Counselor Bill Linehan, the Mayor and the BIG check. Thanks to the Mayor of Boston, Avalon Exeter Residences project, the Boston Redevelopment Association and Betsy Johnson (who chaired PruPac, the citizen's advisory committee). And special thanks to BNAN, which fronted the funds to complete our plantings before this check arrived. In addition to Prudential mitigation money, funds for our new landscaping were also contributed by the Boston Foundation, Winn Management (which manages Castle Square), the Edward Ingersoll Browne Fund, the South End Lower Roxbury Open Space Land Trust and individual Berkeley gardeners. We have a lot of organizations and people to be thankful to and great plantings (getting greater as they mature) to be thankful for!